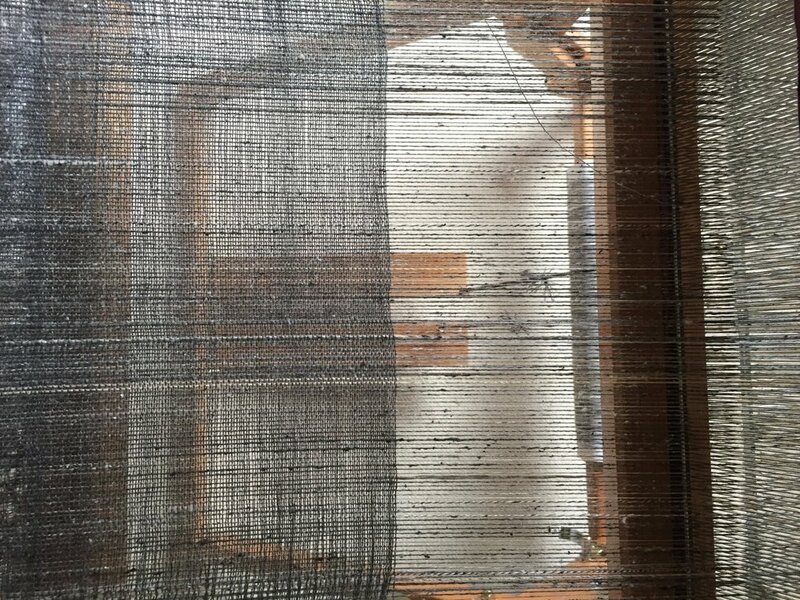 Weaving on a Japanese floor loom I make rectangles to be worn, draped, hung or framed. Using primarily silk and wool I design each piece around a mood or feeling, or something in nature that has touched me whilst out on my regular bike rides in the countryside. The combination of texture and colour drive the design to the point where I try to capture some element of nature. I especially enjoy using the finer wools that are sometimes said to have been plucked or shorn from a young animal. Camel, alpaca and merino are examples of this, and when combined with silk, they make a luxurious and beautiful textile. I also enjoy using vegetable fibres including rose, nettle and soya fibre, and cotton and hemp. Some beautiful and unusual yarns are made in Japan, and I enjoy using a fine stainless steel thread wrapped in pure silk to produce some interesting effects. Much of the yarn I hand spin on a traditional wheel, so from the birth of an idea to the collection of fibre and its subsequent spinning into yarn, to the weaving and finishing of the piece, often takes many weeks to complete. I welcome commissions. Please get in touch.